Event programs can be dull, throw-away affairs. Design for these programs were updated to create treasured souvenirs to attendees and valuable advertising opportunities to sponsors. 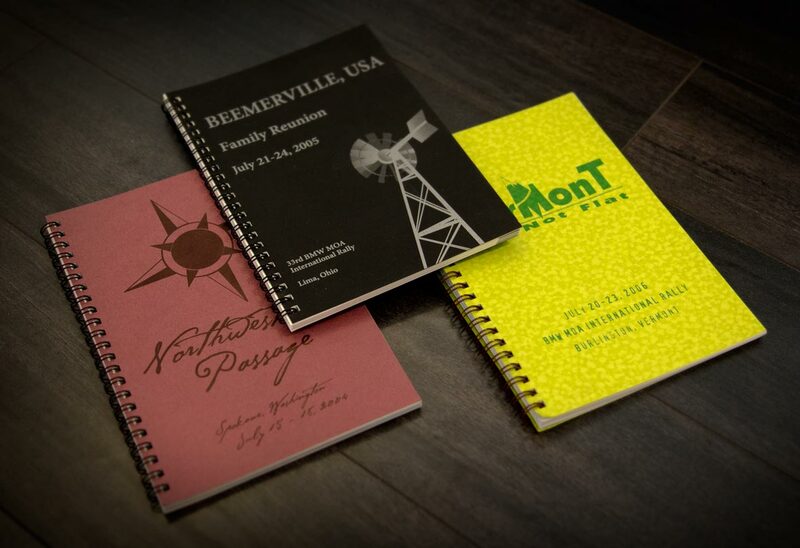 The previous letter-sized and saddle-stitched publications were replaced with handier digest-sized and wire-bound booklets. This is easier to carry, store and lies flat when reading. 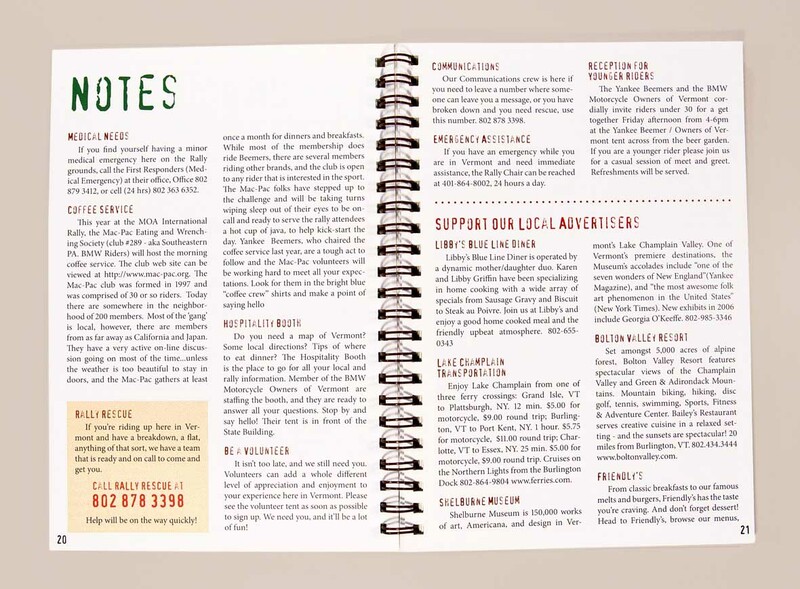 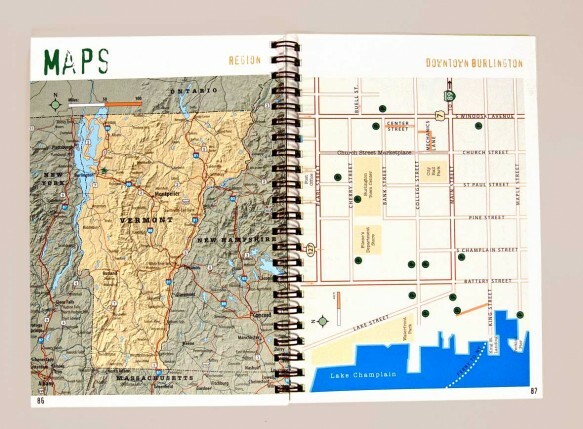 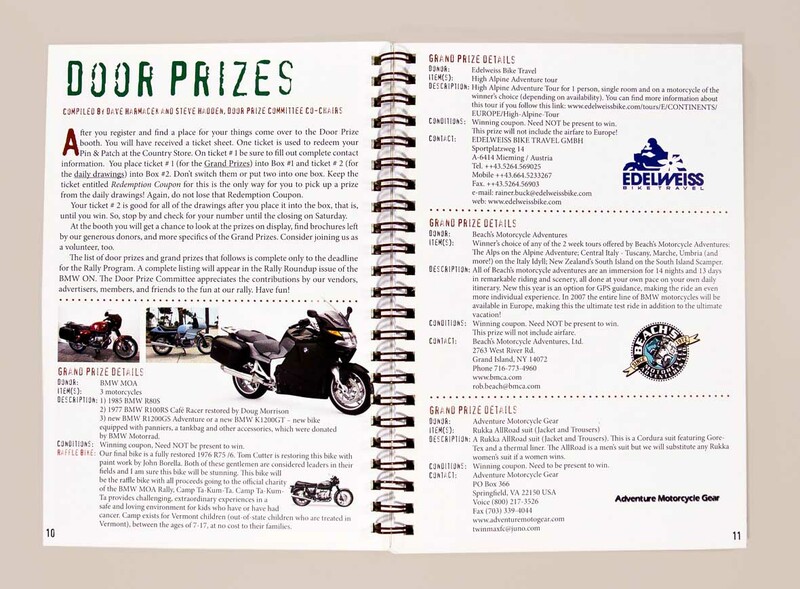 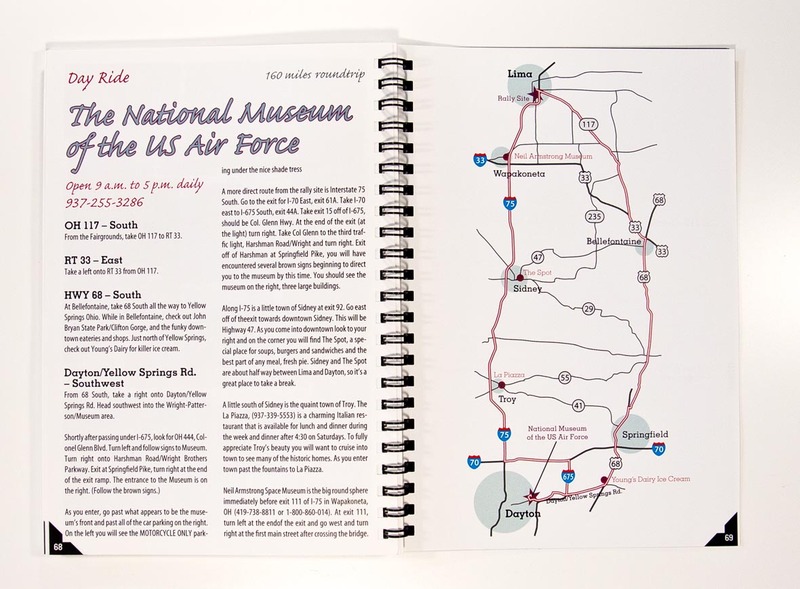 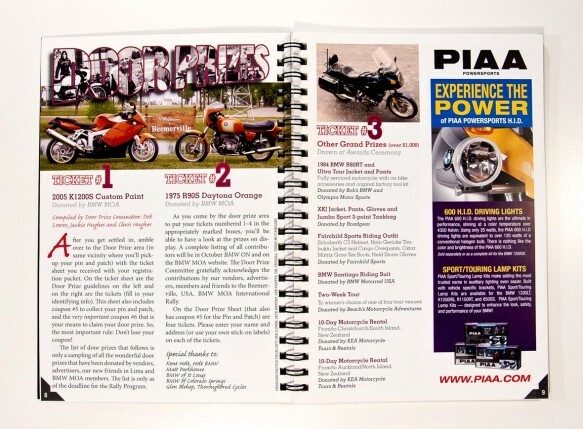 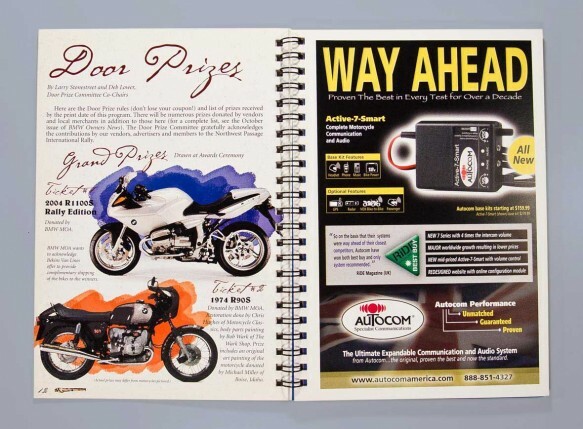 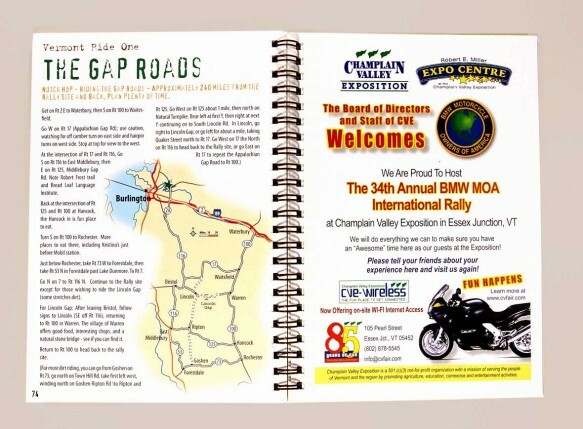 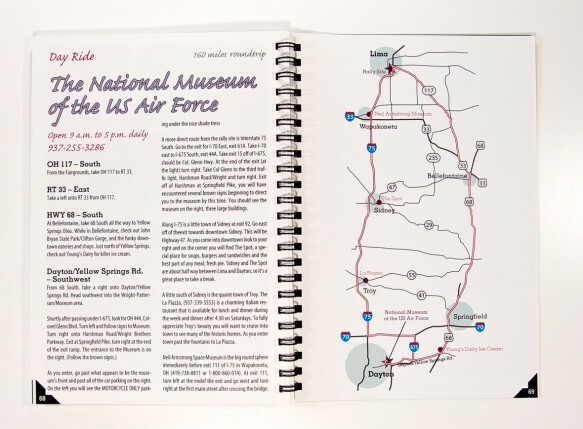 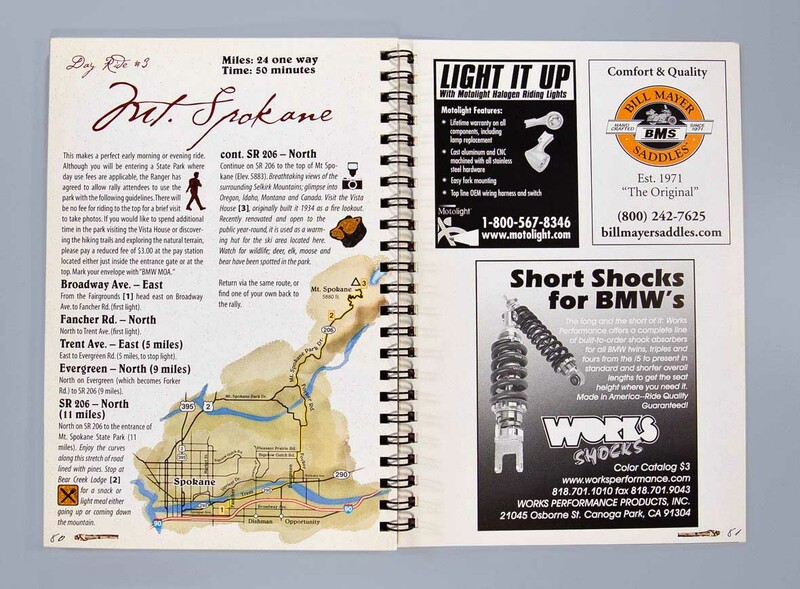 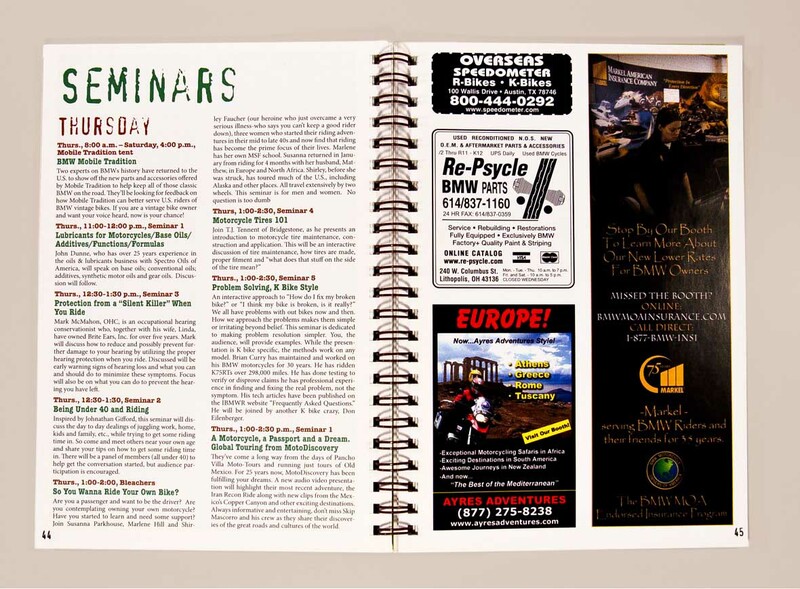 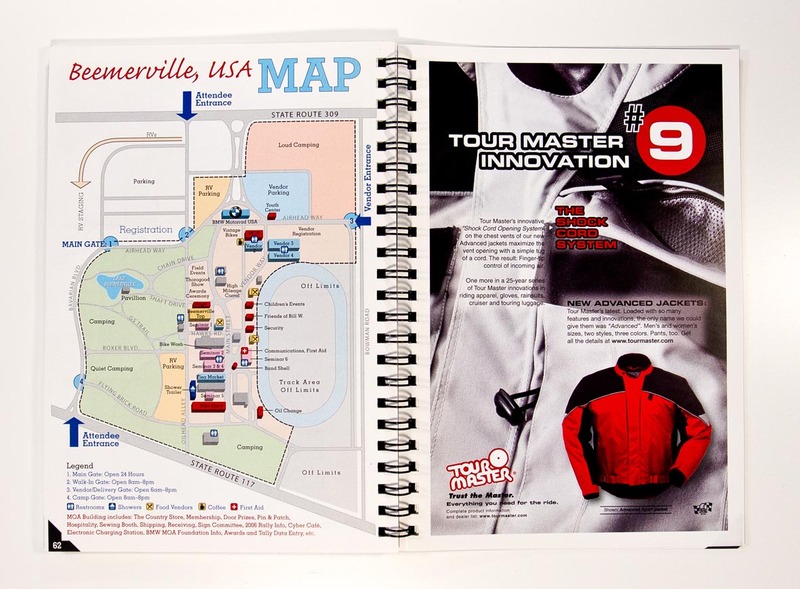 Each program has an individualized theme with matching cover paper stock and includes “day rides” which can be enjoyed during the event or years later (encouraging retention of the programs). 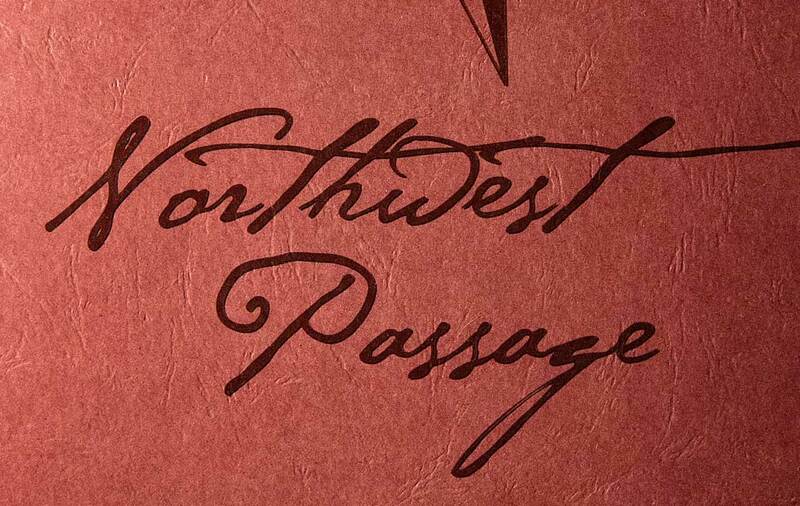 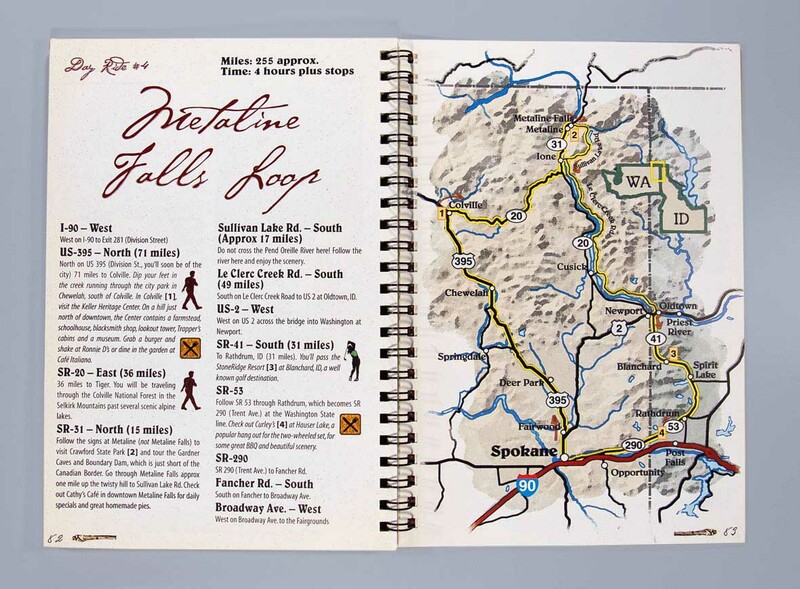 The “Northwest Passage” rally was inspired by the travels of the Lewis and Clark Expedition on its 200th anniversary. 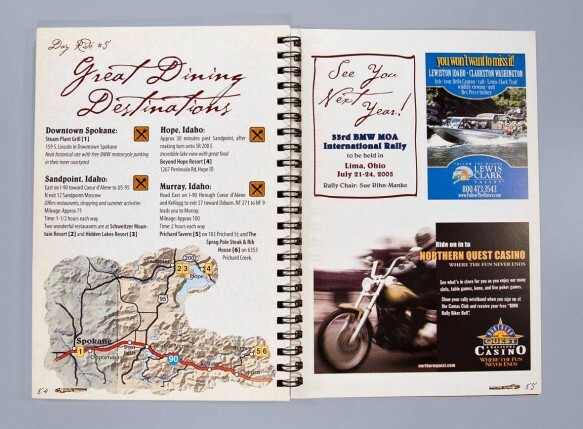 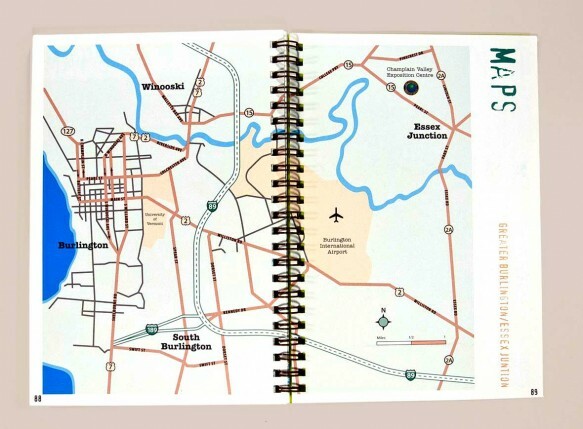 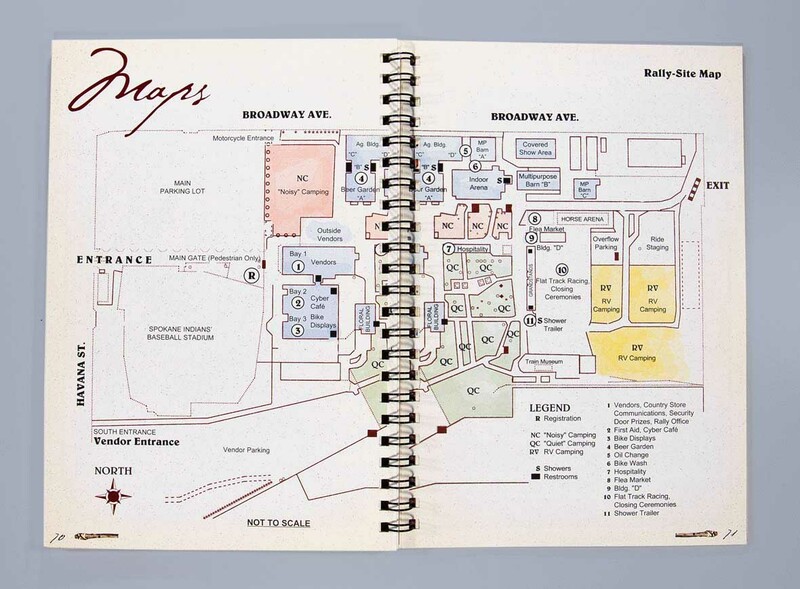 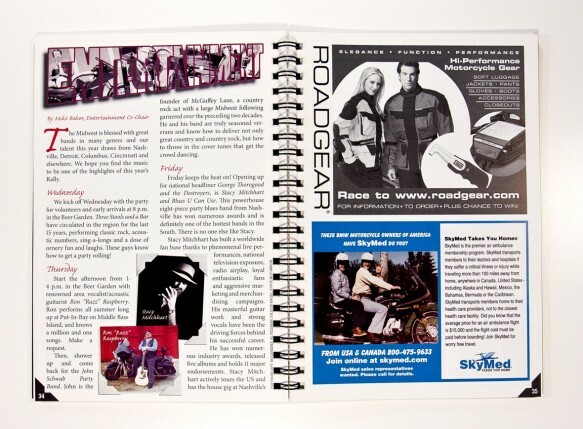 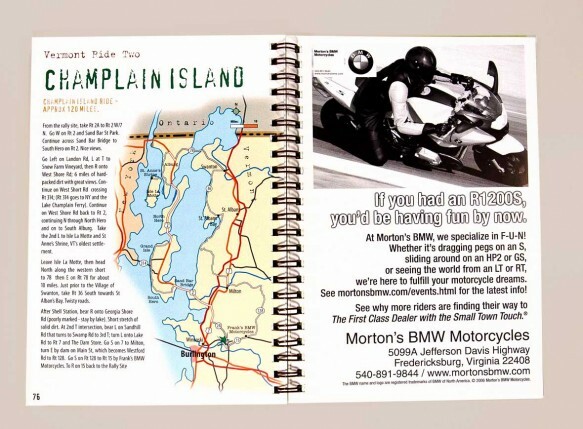 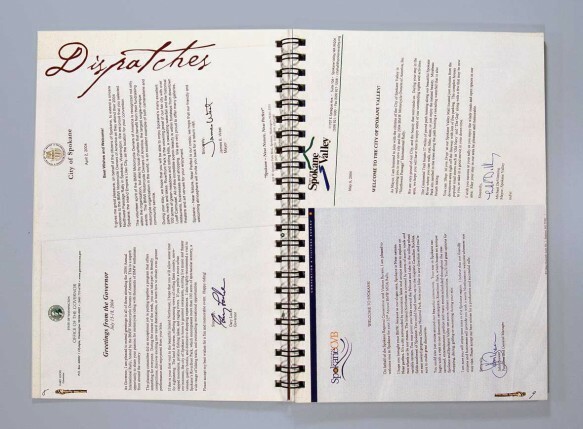 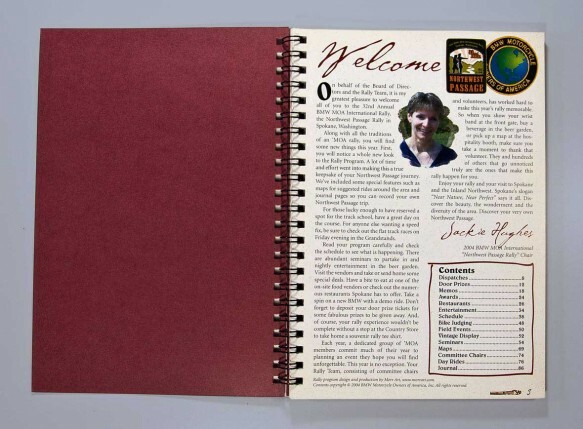 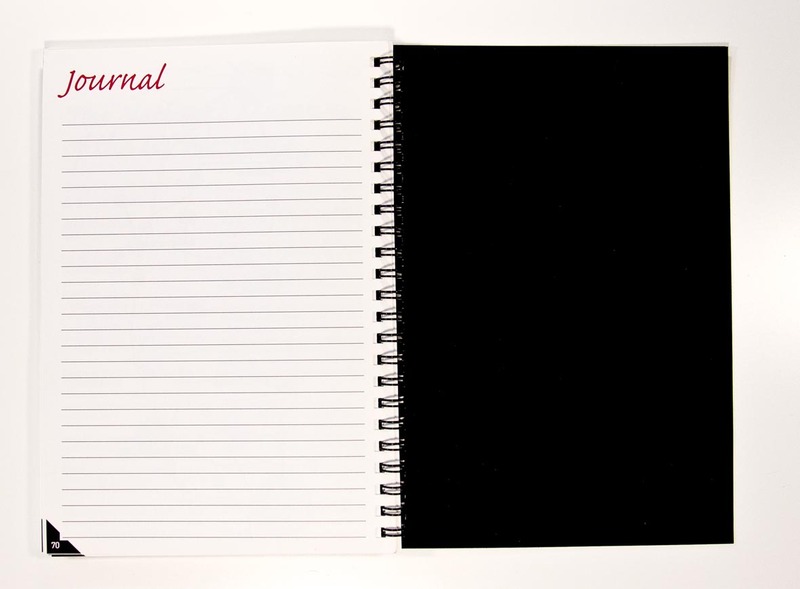 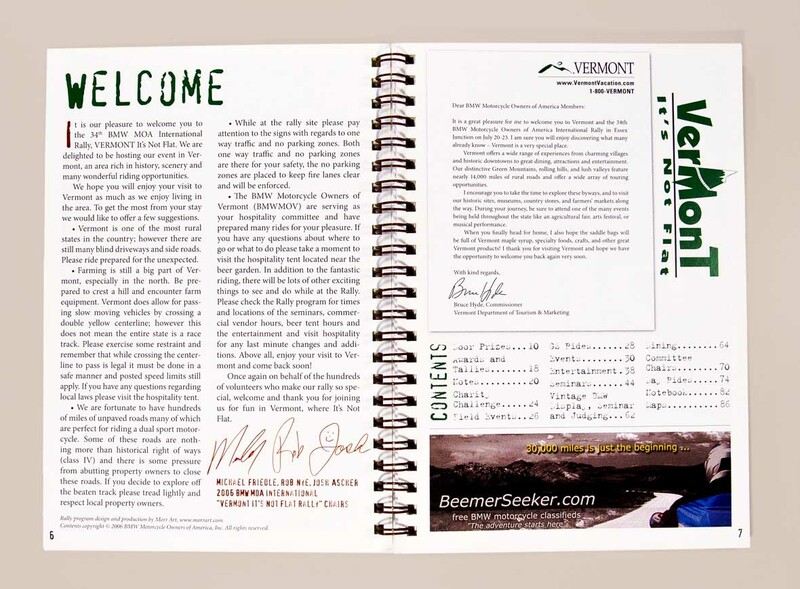 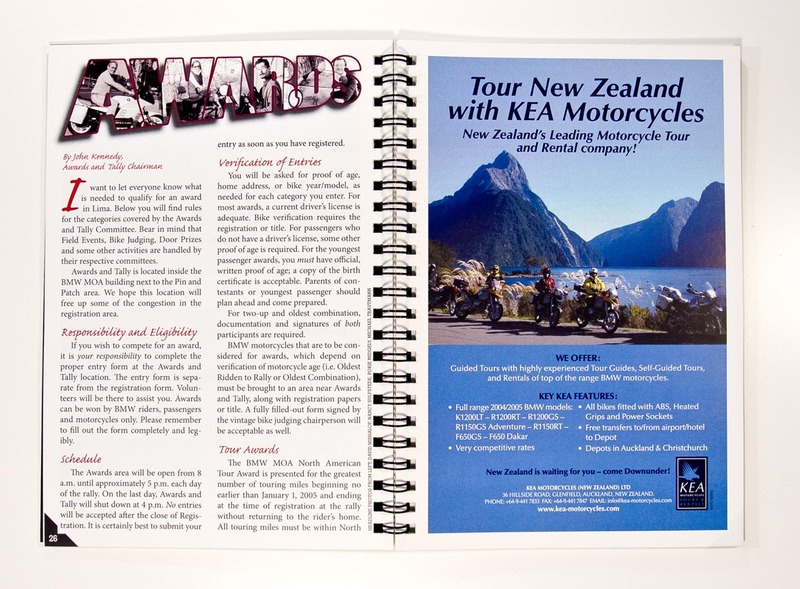 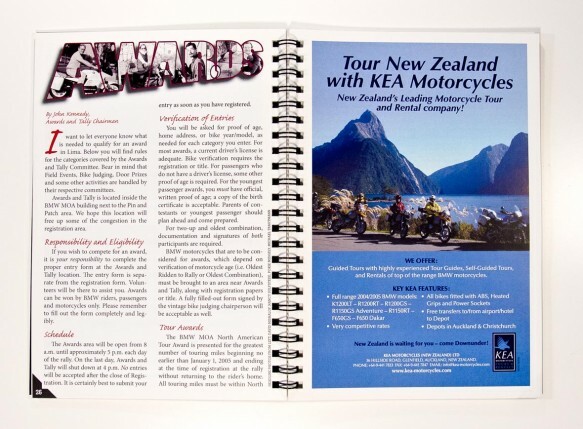 This program had a personal journal theme that included an embossed “leatherette” cover paper and a printed textured paper “look” with torn edges inside. 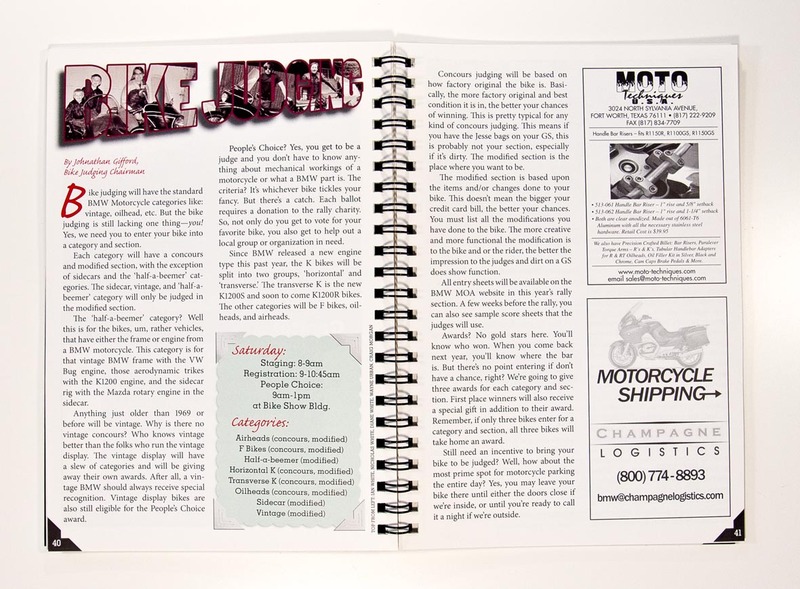 A hand-written style font was chosen for headlines and photos were turned into water color drawings. 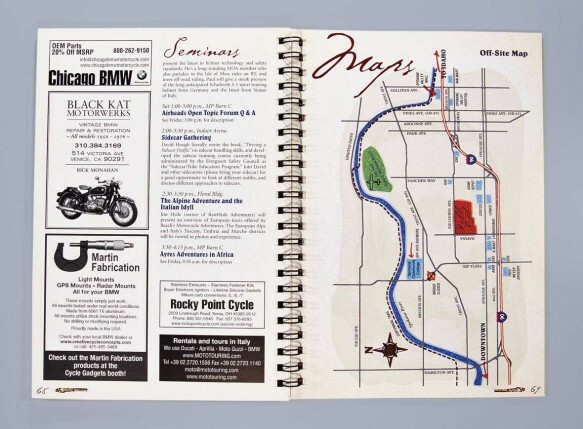 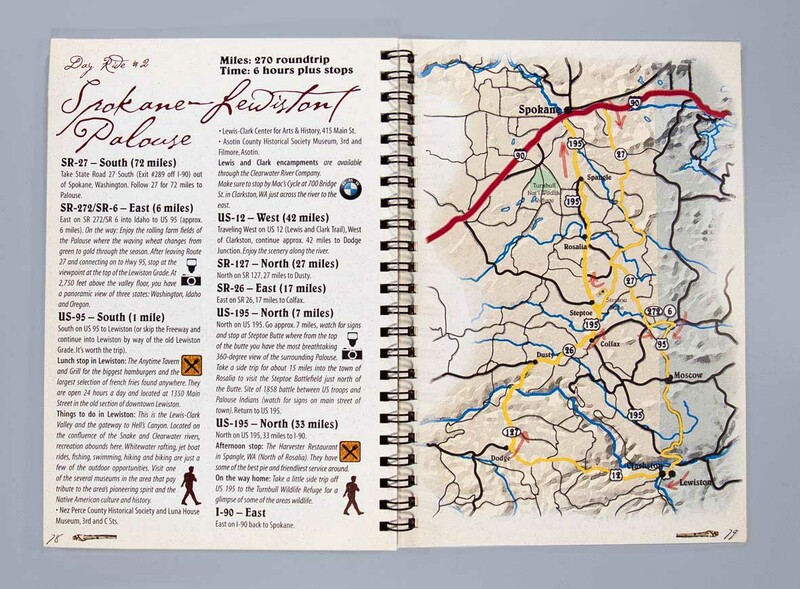 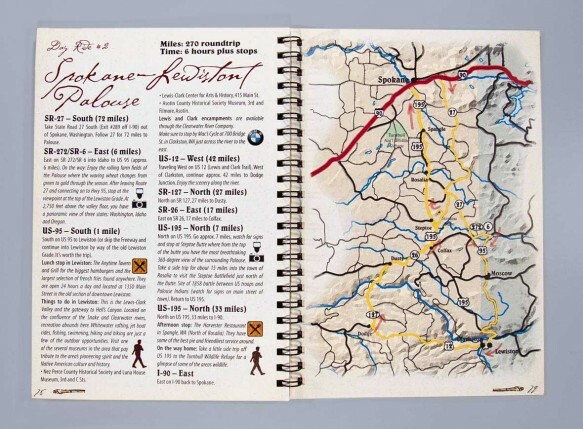 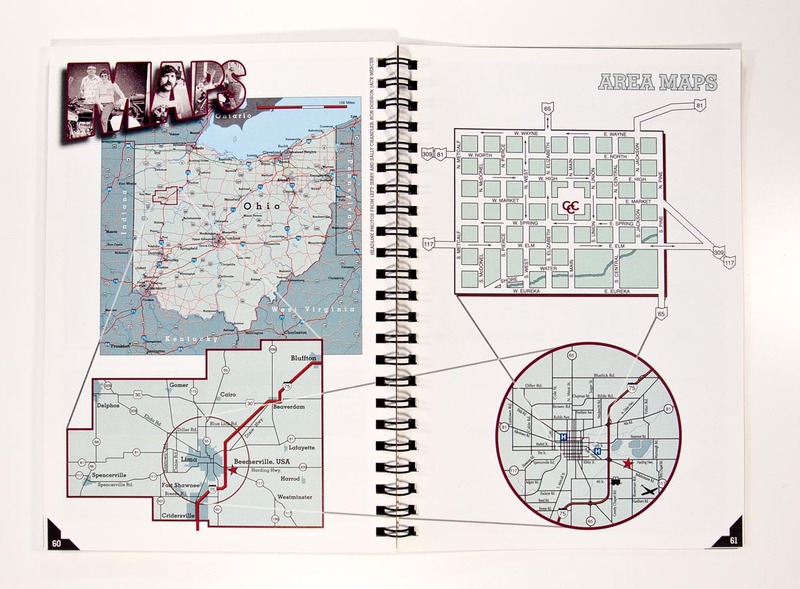 Even the maps were given a hand drawn, water color appearance. 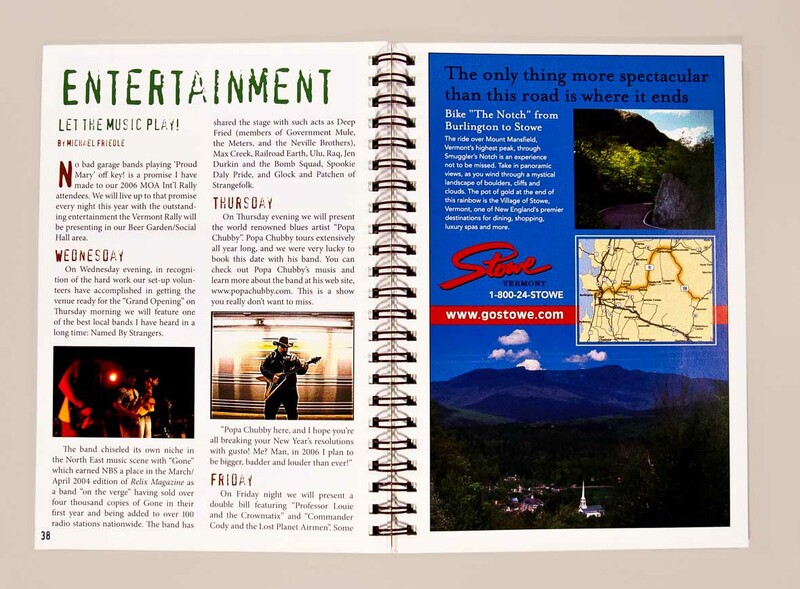 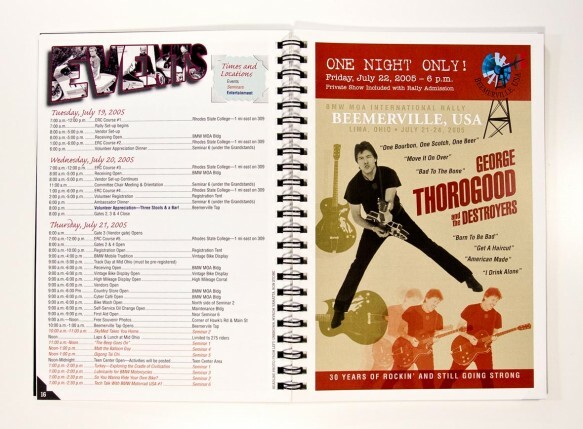 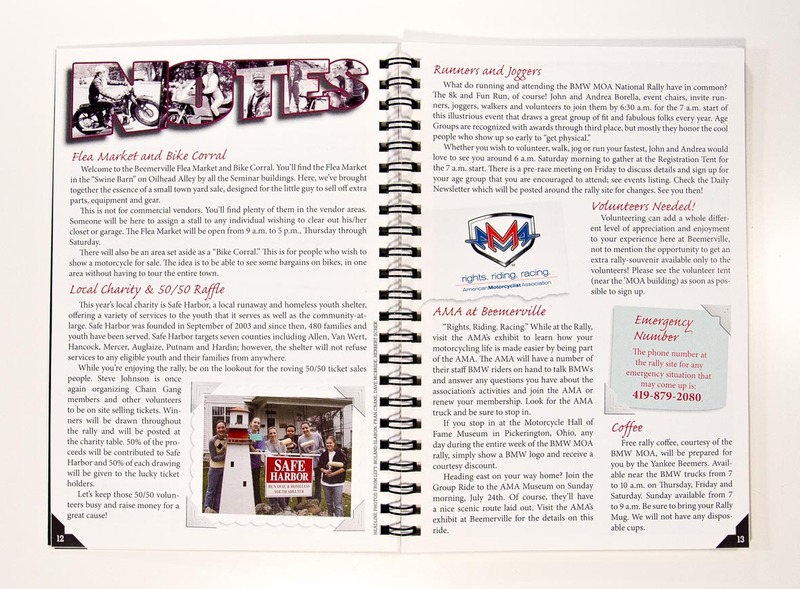 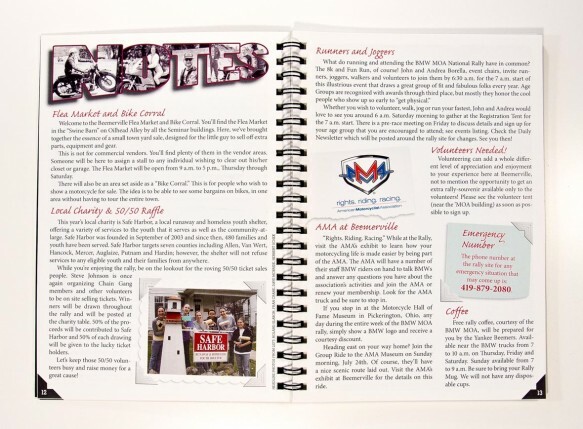 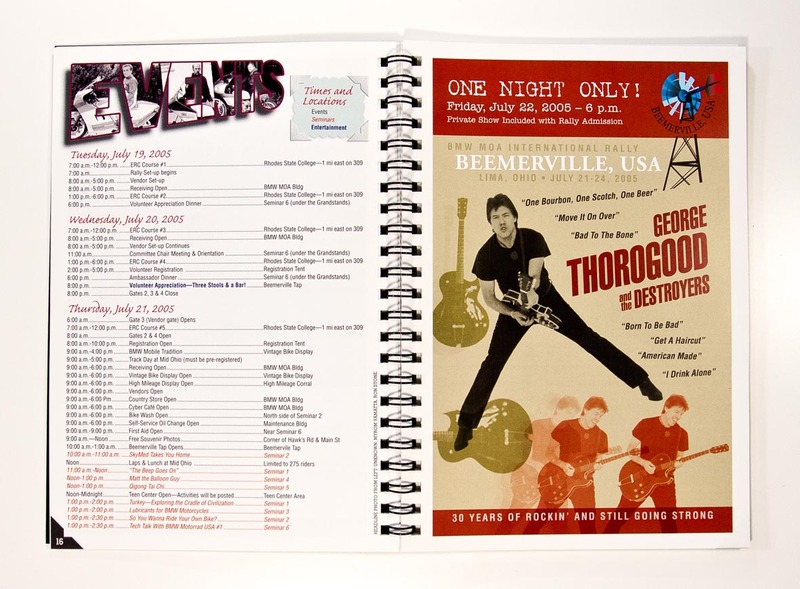 The “Beemerville” rally was marketed as a family reunion and, so, the program received a family scrapbook theme. 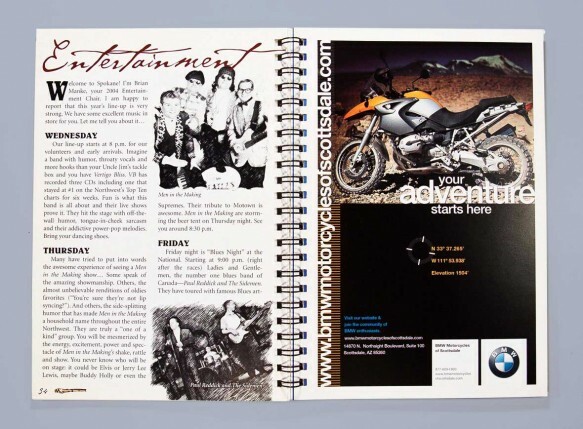 The cover stock was a beautiful matte black with a luxurious velvet feel while the name and illustration used contrasting silver ink. 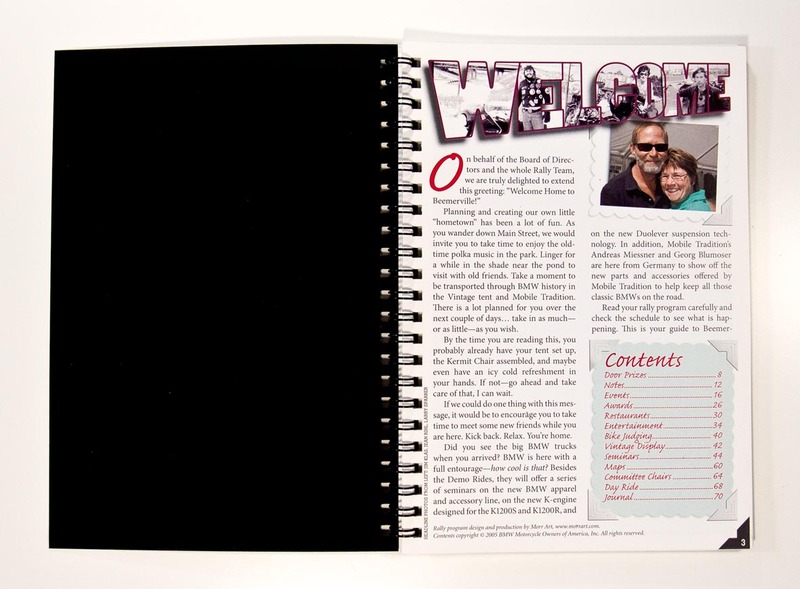 Inside, the section headline’s large block letters are filled with “family” portraits (member images from past events) while article headlines get a hand written marker font. The photos and vintage-inspired scalloped “paper notes” are held in place with what looks like glued-in photo corners. 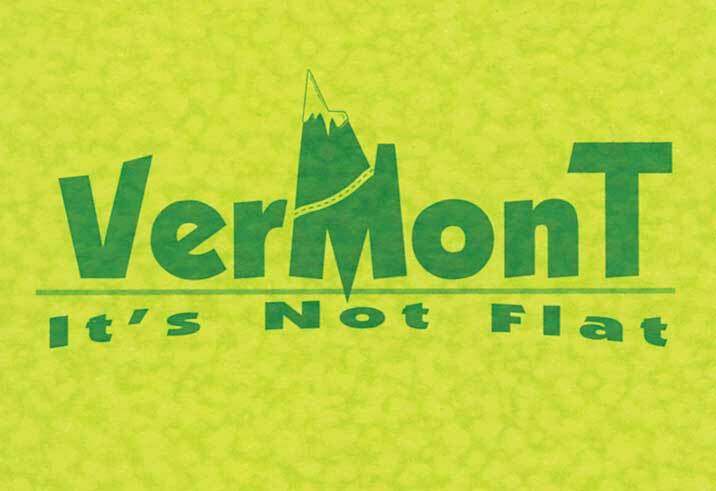 The “It’s Not Flat” rally stressed the gorgeous mountains and forests found on the backroads of Vermont. This program became a guide book complete with “stamped” headlines and boxed type that looked like it was created with an old typewriter. The cover stock was mottled acid green which would reminds attendees of forest leaves or the dappled sunlight which fell in the forest.